The course contains two full length painting demonstrations that you can follow along with, step-by-step, as well as a series of warm ups and exercises to help you paint more creatively and explore your own style & voice. Total content is over 140 minutes. I've packaged this course into my Creating Landscapes watercolour course, which is one of my biggest and most comprehensive classes on my learning site. 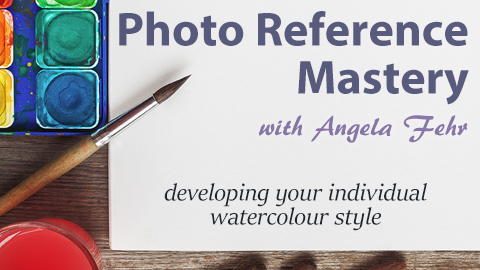 You can enroll in this course for $99 USD ($125 CAD) and receive enrollment in Photo Reference Mastery at no additional charge. If you are already enrolled, you don't have to do anything! Just log in to your account at learn.angelafehr.com and you'll see it in your course listing. Each course is self paced (take as much time as you need to complete it, any time you want) and you get lifetime access, plus a 30 day refund policy because I want to be sure you're happy with the course. And I'm always happy to answer any questions you might have. Email me anytime! A Messy Studio is the Sign of a Happy Artist!